Chocolates made by sandcasting with brown sugar. It won’t be long before we are knee deep in the traditions and events of the holidays. And as a maker, this means lots of opportunities for you to let your creativity and skills loose on special projects and making gifts for family and friends. With chocolate sand casting, you can create edible items molded in unique shapes – shapes as varied and far out as your imagination will go. In this project we’re going to follow the steps of sandcasting – molding metal objects by pouring molten metal into a mold made out of sand. But since sand and molten metal are a little hard to digest, we’ll make chocolate objects using molds created with brown sugar. 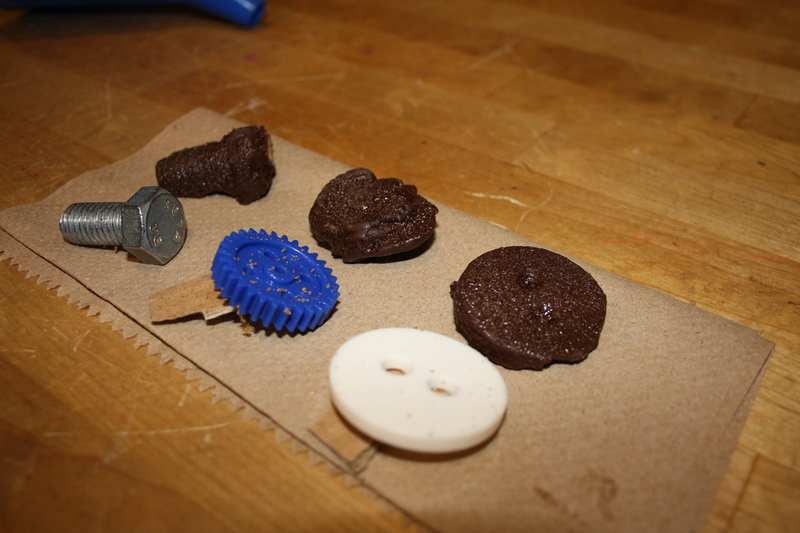 Click here to download step-by-step instructions for Chocolate Sand Casting. Kid-makers, you are never going to believe this. There is a whole entire orchestra that performs music on VEGETABLES. Check out this video , showing the musical makers of the Vienna Vegetable Orchestra choosing their veggies at the market, drilling carrots and radishes to build their instruments, then performing live in a concert hall. Did you know that you could just pull a veggie out of the fridge and make a clarinet, drum or kazoo? This is The MAKESHOP™ Show, so of course we’ll show you how!